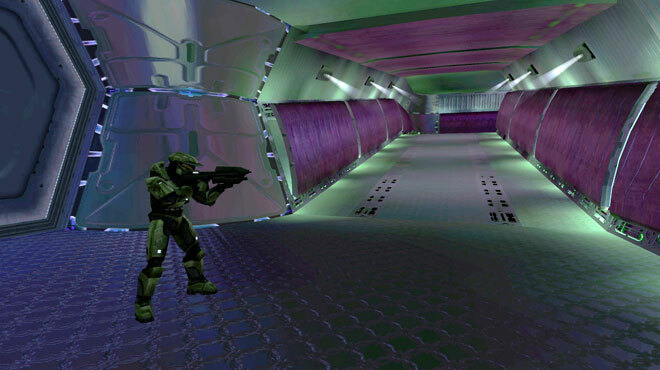 The original Halo was such a landmark, you may wish you could go back to 2001 and discover it all over again. But gamer nostalgia doesn’t take Moore’s law into account. If you did go back, you’d say: The graphics are terrible! My TV is so tiny! Oh crap, I have to go tell everyone not to see Death to Smoochy! To give gamers the best of both worlds (and make more money off a product they’ve already sold to us once), many publishers are now remastering back-catalog titles for rerelease. Among the latest to go retro-modern is Halo: Combat Evolved , just in time for the title’s 10-year anniversary. To make the old Xbox warhorse look like an all-new Xbox 360 release, the resolution of some campaign environments has been boosted up to 8,000 percent, and players who got lost in that foggy swamp level (you know, the one in the sixth campaign) will find that the new iridescent greens and blues of the foliage help them stay on track. But this is just the beginning. “We’re improving the graphics,” says executive producer Dan Ayoub. “But we didn’t want to just up-res it and be done.” The original version of the shooter predated Xbox LIVE, so online multiplayer functionality got added. The orchestral stereo score was rerecorded for 5.1 surround, and the sound effects were all remixed at Skywalker Sound. Then there is the matter of the engine that renders the physics of the game. The temptation was to just swap in the brawnier engine that powered the latest sequel, last year’s Halo: Reach . “But there would have been subtle changes to gameplay if we did that,” says development director Frank O’Connor. “We had to keep it absolutely identical.” So the reissue runs on two engines simultaneously—the original powers the gameplay physics and artificial intelligence, and a new one renders the graphics. Result: The look of the game is a revelation, but the feel is precisely the same. If that doesn’t work for you, there’s also a sop to sticklers who want the unvarnished experience—just hit the Back button to see the game in all its pixelated 2001 splendor.